Scuba diving and snorkeling in Cape Verde islands is absolutely fantastic. There are a lot of known reefs, several ship wrecks and even sharks to be seen. 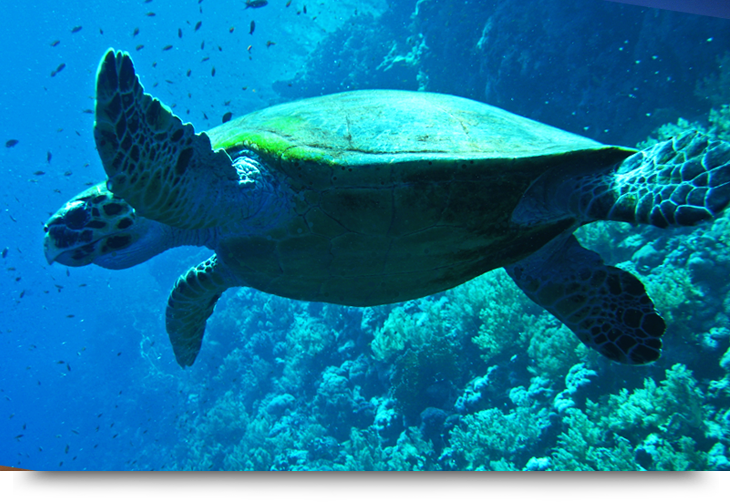 Cape Verde islands are also known for having several nesting beaches for big sea turtles, the loggerhead turtle. We found the best diving reefs, beaches and scuba diving organizers around the island of Sal in Santa Maria town. We spent our scuba diving holiday in Cape Verde for one week in november 2011. And it was absolutely fantastic! My best scuba diving holiday so far. It is less windy in Cape Verde islands between april to november, and those months should provide the clearest waters and the best diving conditions maybe? There are several diving organizers in Cape Verde islands, mostly in Sal and Santa Maria town. Scuba diving services are available in different price ranges. A single dive in Sal is about 20-50 euros depending on the size of the group, location etc. Renting the scuba diving equipments is about 10-15 euros / day. Negotiate with locals at the dock to find the best price. You might see grouper, tuna, mackerel, wahoo, lobster, manta, turtles and colorful tropical reef fish. Sharks are rare but you might get lucky. A good spot in Cape Verde and Sal, specially for sharks, is just north of Baia de Parda. Baia de Parda is located 1-2 km south of Pedra Lume on the island of Sal. The sharks are known for getting very close to land at Baia de Parda. You can even see them from the shore. October to December are the best months for spotting sharks at dawn in the Cape Verde islands. Another great coral reef is just outside the town Murdeira on the island of Sal. We were lucky to see almost all mentioned fish above on our scuba diving holiday, and I can’t wait to go for my next scuba diving holiday to Cape Verde islands. Buracona was a great diving spot for us (up north near Palmeira / Sal). At 5-20 m deep there are natural caves and grottos and green / blue absolutely beautiful waters. Other sights was The Bera Coral reef, Pontinha and Farol. Ask your organizer for more tips on reefs and ship wrecks. Don’t worry if you are a beginner. The scuba diving and snorkeling organizers in Cape Verde islands often offers free diving training in a pool before the actual dive at sea. If you are new to scuba diving and snorkeling, make sure the instructor speaks good English (or whatever language you speak) and choose easy waters with less underwater currents for the first dives. Snorkeling is the first step, then try diving. It can be hard to snorkel just of the shore in Cape Verde islands because of the waves and cloudy water near the beach. Late summer months brings sting rays, morays, mantas, barracudas, nurse sharks and more rarely sand sharks and tiger sharks to Cape Verde islands. Whale sharks can be seen but this is very rare. We are planing to get back to Cape Verde islands in august next year for another great scuba diving holiday.